Wow…we have come to the end of our first week of Create with Connie and Mary Summer Collection 2014! Although our projects throughout the week only for our subscribers, on Saturdays we have a challenge that anyone can join! And the design teams posts their projects on their blogs. Now…if you are not a subscriber yet…don’t worry…there is still time to join! Sweet Taffy dsp – hexagon print 3 3/8 x 4 5/8, layer on Basic Black 3 1/2 x 4 3/4. Add Tempting Turquoise flag 3/4 x 4 1/4. Cut end into flag and add to card front using dimensionals. Stamp each of the circle images from Amazing Birthday using Versamark on Whisper White and black emboss. Use Melon Mambo, Daffodil Delight, and Tempting Turquoise markers to colors them, then punch out using the 1 1/4″ Circle Punch. Add to card front using dimensionals. We have just finished the first week of Create with Connie and Mary Summer Collection 2014! If you are looking for ways to use all that ‘new stuff’ that you just got, this is for you! This collection features products from the NEW CATALOG…you don’t want to miss it! 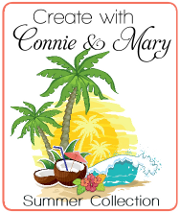 Don’t forget to head on over to Create with Connie and Mary and check out the projects by the design team! This entry was posted in Create with Connie and Mary and tagged Amazing Birthday. Bookmark the permalink. Super cute dsp! And I love how you colored the embossed images! Very fun card! Fabulous card! I love the bright colors with the little bit of Basic Black, the colors look extra amazing!